Lighting is an essential part of beautiful video and still photography, and reflective items and surfaces like glossy counters can really rain on your parade. Everyday household objects like silverware or cabinet knobs often have a bright sheen that looks perfectly natural in person, but can dominate the screen and distract the eye when caught on camera. For our studio work, it's important to use matte counters and non-shiny props to avoid jagged, off-putting beams of light. For this reason, the lighting setups in film clips and professional photos have to be carefully designed and controlled. Since natural light can be unpredictable, most of the lighting for shoots is brought in and designed on-site. Our set lights are extremely bright, even on their lowest settings. These strong beams of light reflect off of everything: faucets, sinks, glass panes, drawer pulls, cabinet handles — and especially countertops and surfaces. Most commercial counters, particularly those made of stone, have a glossy, shiny finish which is perfect for the home, but is too reflective for the camera. Cosentino’s Silestone line of countertops are available in a suede texture, which provides a smooth, matte finish. This subtle glaze creates a soft glow rather than harsh, defined pools of light, and looks beautiful and natural through the camera's lens. In addition to photographing well, our Silestone countertops are made of quartz composite, making them extremely durable and resistant to scratching. Because they’re non-porous, they repel stains and acid damage, too, so they look flawless on camera and will last for years of filming. All of our studios feature Silestone counters, including Grey Amazon, a deep grey with charcoal marbling, and Lagoon, a sleek shade of white with subtle grey tones. Both colors are extremely versatile and can be easily styled for a wide variety of products and applications, making these countertops an essential component in our beautiful new kitchen studios. SeeFood Media & Driscoll's Berries Win Two Telly Awards! In 2014, SeeFood Media created a webseries with cookbook author Dorie Greenspan for Driscoll’s Berries. We are happy to report that we’ve won a Bronze Telly Award for the series and a Silver Telly Award for one of the individual videos! Check out the series, titled Desserts with Dorie, here; the video, “DIY Raspberry Tart,” is below. Raspberry-Cranberry Spiced Cheesecake, by Dorie Greenspan for Driscoll's. The videos were produced here at SeeFood Media’s kitchen studios, based on interviews done with Dorie, which formed the backbone of many of the videos. This meant that Dorie could focus on having fun during shooting, rather than needing to follow a script. Our team worked with Driscoll's to choose everything from the props to Dorie’s wardrobe. Our director, Jamie Tiampo, placed Dorie and her stories as the centerpiece of each video. Her sunny personality and passion for baking shine through in the videos, and pair perfectly with Driscoll’s delicious berries! It was a delight working with Dorie and Driscoll’s, and seeing these videos gain recognition is an added bonus. Dorie Greenspan is the author of eleven cookbooks, and has won six James Beard and IACP Awards. She has won IACP’s Cookbook of the Year Award twice, for Around My French Table and Desserts by Pierre Hermé. Dorie and her husband, Michael, in their home in Paris. Telly Awards are given to outstanding film and video productions every year. The Silver Telly is the highest award that a production can win, and is given to any deserving entry—that is to say, no entry is competing against any other, instead being judged only on its own merit. In years past, the Telly Awards have received more than 12,000 entries from all 50 states and 5 continents. Other category winners this year include videos by Coca Cola, Ford, Microsoft, and HP. When Bobby Deen launched his cookbook of healthy, southern comfort food recipes under 350 calories, it made him the perfect host for Weight Watchers’ “In the Kitchen” web series. SeeFood Media worked with Bobby and Weight Watchers to create videos around some of Bobby’s favorite recipes, Mini Savannah Crab Cakes, Succotash, Old-Fashioned Meatloaf, and Southern Tomato Sandwiches. We worked with the Weight Watchers’ team on scripting to highlight tips and tricks for creating yummy foods without the major calories. Tips like adding carrots to crab cakes, using low fat mayonnaise, and making crab cakes bite size instead of full size, so portions are smaller from the start. Our styling team created a southern home-inspired set for Bobby from our prop closet, with plenty of red and wood highlights. The set was lit for a bright, sunny look (like Bobby’s personality) and the footage was shot with Canon C300 cameras and plenty of TLC! Check out his videos at weightwatchers.com and see for yourself. What is eatTV, you ask? Well, when we aren’t shooting at SeeFood Media, we use our “downtime” to work on eatTV. This video-focused, web-based food magazine showcases everything food-related that we think is pretty cool. From the people (the singing farmers at Sylvestor Manor, Eddie Huang talking late night drunk food) to the places (check out this ultimate farm-to-table feast), we ate our way through all corners of the food world. And people noticed. 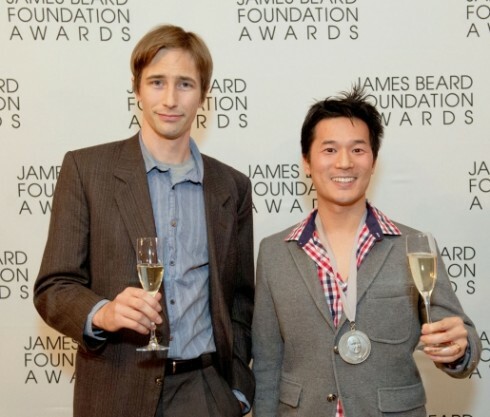 Each spring, the James Beard Foundation Awards honors the nation’s greatest restaurants, chefs and tastemakers. 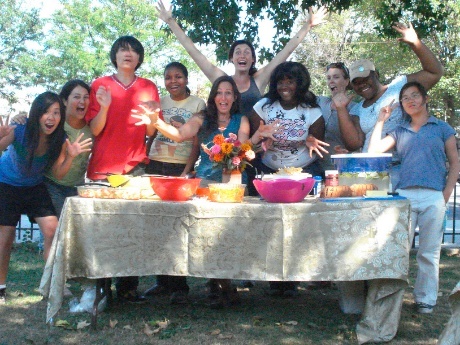 But what about everyone else – the cookbook authors, storytellers and producers? The JBF Book, Broadcast & Journalism Awards honors just these folks. You can imagine our excitement when eatTV was awarded a JBF Broadcast Media award for best Video Webcast. We were so honored and humbled by the award. Most of all, we’re excited by the attention on real food issues like sustainable meat, food deserts and urban gardens, and issues that tug at our heart strings, like this doctor turned dairy farmer and his coop. Ever wish you could cook with a legend? Learn those chef-coveted secrets? Flambésomething? Two home cooks did just that. 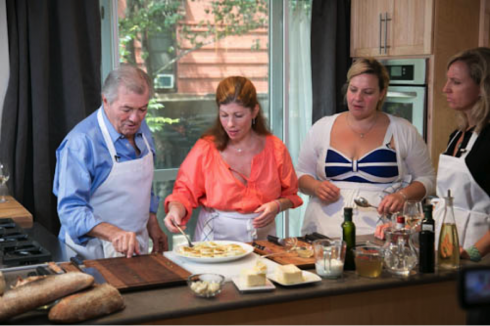 SeeFood Media partnered with the James Beard Foundation to auction a cooking demonstration filmed at our studios with Jacques Pépin and his daughter Claudine.Linton Media provided production services. All proceeds benefited the Foundation. All food benefited our stomachs. Jacques Pépin is an internationally known French chef, cookbook author and television personality, gaining fame alongside Julia Child. His daughter Claudine has followed in her father’s footsteps, appearing on PBS cooking specials. No boneless, skinless breasts here; Pépin broke down a chicken in record time. The winners acted as sous chefs to the Pépin duo – chopping, seasoning and tasting each course. The pièce de résistance were the Crêpes Suzette. The ubiquitous dessert includes a rich buttery sauce set aflame with orange liquor and served over thin crêpe. The ladies left with a newfound understanding of food video production. And full stomachs! From our archives at eatTV, our James Beard-award winning food video showcase, here’s a bit about our video featuring the White House garden. There’s a garden growing at the White House, and another in Crown Heights, Brooklyn. Different home bases, with remarkably similar goals: to educate people about the benefits of growing and eating fresh fruits and vegetables. We met up with the organizers of each garden at the IACP Regional NY Conference to learn why gardens are such powerful resources in communities starved for fresh foods. 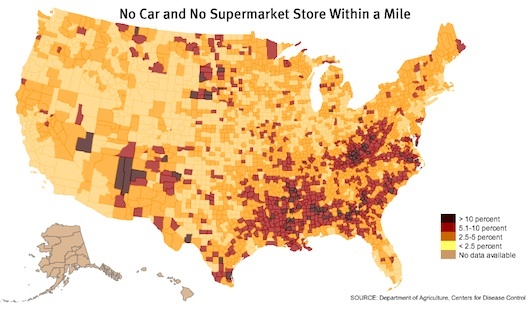 Nationwide, 2.3 million Americans live in a food desert: they are more than a mile from a supermarket without an easy mode of transportation to get there. Not coincidentally, the neighborhoods that have the least fresh food available are the same neighborhoods where cases of diet-related health problems like diabetes and obesity are high. Over the past 30 years,obesity rates in the U.S. have tripled, and today, one in three kids is overweight or obese. In African-American and Hispanic neighborhoods, around 40% of all children are overweight. Fresh fruits and vegetables are cornerstones of a healthy diet, but so many Americans don’t take the time, don’t know how to cook, can’t afford or can’t find the fresh produce needed to make a healthy meal. 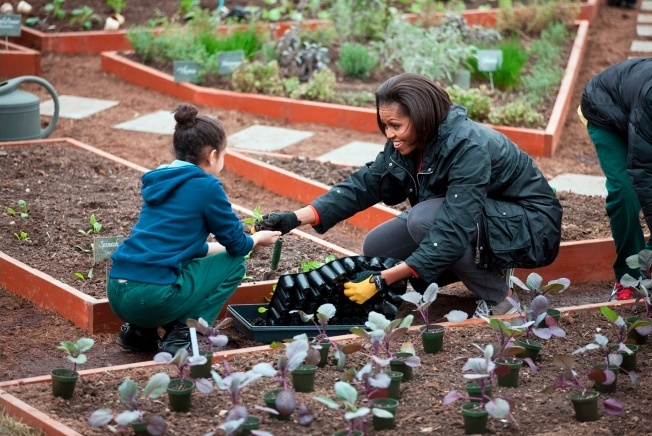 Sam Kass (White House Assistant Chef & Senior Policy Advisor for Healthy Food Initiatives) worked with Michelle Obama to plant the first kitchen garden on White House grounds since Eleanor Roosevelt built her Victory Garden during WWII. It’s part of the Obama/Kass team effort to battle rising national obesity rates and increase fresh food access through initiatives like Let’s Move! and Chefs Moves to Schools. The White House garden has produced 2,000 pounds of food so far from over 50 varieties of produce, including familiar things like spinach, peas, and raspberries, and the less familiar mizuna lettuces and anise hyssop herbs. More than anything, the garden is a symbol and a conversation starter. Anyone passing by can witness the bounty of kale and lettuces growing in the raised beds, or the green beans climbing up the corn stalks. Local students are invited in to get their hands in the dirt and taste unfamiliar things like kohlrabi and leeks. Kass claims that when the First Lady goes to international summits, the kitchen garden “is all they want to talk about.” He says that the White House garden is helping to reestablish “a connection that’s been lost,” and that community gardens and school farms are cropping up all over the country. Like in Crown Heights, Brooklyn, for instance. Stacey Murphy (BK Farmyards) is trying to reestablish a connection to growing and eating fresh foods in a neighborhood where much food comes out of boxes and cans, and where fried chicken and pork rinds are more readily available than apples and oranges. 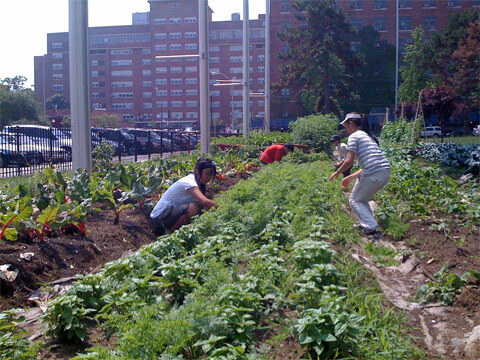 In the spring of 2010, Murphy helped build the High School for Public Service Youth Farm, a garden less symbolic than it is utilitarian: it’s bringing fresh produce into a neighborhood starving for it. In its first year, over 100 students cultivated ½ an acre to grow more than 50 varieties of produce—foods many of the students had never even tried. The benefits are startling: some students have lost weight, while others have become vegetarian. All are eating more fresh foods and vegetables, and are introducing new flavors and recipes to their families at home. The produce is sold at a weekly farmers market, where fruits and vegetables sell out immediately, and through a CSA, where community members can buy “shares” in the farm, entitling them to fresh produce every week. In the next two years, the plan is to cultivate twice as much land, growing twice as many fruits and vegetables for their produce-starved neighborhood. Both the White House kitchen garden and the High School for Public Service Youth Farm are banking on the premise that getting kids excited about growing their own foods, and the deliciousness that comes from eating fresh fruits and vegetables, will help stem the rising tide of obesity and food-related diseases with the next generation. These gardens symbolize the benefits of fresh, unprocessed whole foods, plucked straight from the ground, not out of package. Click here to watch a video about some more innovative solutions to food deserts. From the archives of eatTV, our James Beard-award winning food video showcase, check out our video into the world of artisanal salt. Mark Bitterman, a self-proclaimed Selmelier, is more than a little bit obsessed with salt. Step into The Meadow, his jewel-box of a store in the West Village of Manhattan (or the original location in Portland, Oregon) and be taken on a journey to the bottom of lakes and seas, across mountains and salt flats, and through deserts on camelback to explore the vastly wide—and largely unknown—world of salt. To many, salt is just that thing you add to your food for, well, saltiness. It’s salt, so it’s one thing, right? Not exactly. What we call table salt is a chemical compound made mostly of sodium chloride. 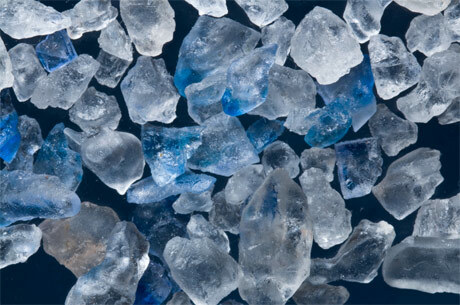 But natural sea salts are actually made up of over 85 different minerals, each with unique characteristics and uses. Every salt in the store has a story—from its unique mineral properties to how the locals harvest it, to how it feels and tastes—and Bitterman is all too keen to tell them, with that sparkle in his blue eyes and his giddy giggle that comes when he talks about what he loves. With such stunning texture, color, and shape accompanied by stories like these, you can’t help but be excited by these artisanal salts. The descriptions above come from his James Beard Award-winning book, Salted, which he fittingly subtitles a “Manifesto.” The book is both a love letter to and an encyclopedia of all things salt. There’s more in this tome than you could ever imagine about salt, more than maybe you even want to know about salt. My advice is pay attention to this man. Your food will look, and taste, better. “The idea behind using good salts is that this is a fundamental ingredient that seasons everything you cook,” says Bitterman. You may not be quite ready to take on 120 salts now, but Bitterman asserts that making just a few changes to your salting habits can dramatically alter your cooking. We make it easy: in this food video, the Selmelier does the work for you, assembling a Toolbox of Salt. Buy these four types of salt—Sel Gris,Fleur De Sel, Flake Salt, and Infused Salt—and your food will, well, rock.